The fascinating and diverse Bahamas wildlife plays an important role in drawing people from around the globe to visit this thriving archipelago. With everything from crowd-pleasing dolphins to unlikely farm animals and prehistoric lizards, wildlife in the Bahamas has proven to be an absolute paradise for nature lovers. Perhaps the most unusual of all wildlife attractions would be the Bahamas pigs. They appear to be ordinary farm pigs, which in itself may not seem exciting to almost anyone. However, visiting the Bahamas pigs is the single most sought after trip in the world, and for good reason. The reason for these porcine’s popularity is their setting. Based on an island called Big Major Cay and nick-named the Pig Beach or Pig Island, these delightful creatures paddle and splash in the shallows of this idyllic beach to their heart’s content. In fact, when arriving by speedboat, you will undoubtedly be met with a number of upturned snouts, grunting and puffing as they paddle out to meet you. While there are a great number of theories as to how these pigs ended up on their own little island, and discussing these theories with locals can be very entertaining, the truth is that they were moved here from a settlement on another island due to their smell, and as the settlement developed and moved away from farming, the pigs were forgotten. Fortunately, Bahamas wildlife is important enough to the government and people alike, and these pigs truly do have everything they could need to survive and thrive in their paradisiac environment. Want to visit the Bahamas Swimming Pigs? Choose one of our tours from Miami or Nassau. If you want to see more of the Bahamas wildlife, but aren’t quite ready to dive beneath the waves, your next stop should certainly be Bitter Guana Cay, also known as Iguana island Bahamas. Unlike the comical atmosphere of the Bahamas pigs, a visit to Bitter Guana Cay will be like a trip back in time. Bahamian Rock Iguanas roam the white sand or sun themselves on rocks. What makes this quite a unique stop on your Bahamas wildlife tour is the apparent tame nature of these creatures. This is, however, not the case. Since these creatures have no natural predators, they aren’t wary of new arrivals, which means that these fascinating lizards can be viewed at a relatively close distance, and will also generally hold still for some excellent photographs. Iguana Island in the Bahamas is a marvelously prehistoric place to visit because of its residents, and as they lumber across the beach you may begin to feel that any number of other creatures could be found just past the treeline. These Iguanas are unfortunately listed as endangered creatures, but the Bahamas has developed sanctuary’s and put rules in place to ensure this species’ survival. Want to visit the Iguana Island Bahamas? Choose one of our tours from Miami or Nassau. Naturally, like any other destination on earth, looking to the skies will also yield rewards in the Bahamas. Bahamas wildlife is diverse and includes a number of interesting bird life to study. The Bahamas flamingo is among the most popular attractions in the Bahamas. A trip to Lake Rosa on the Inagua Islands is the ideal place to view these birds, with more than 80 000 flamingos flocking here to feast on the tasty morsels that crowd the waters. Curiously, the bone shrimp on which they feast is loaded with beta carotene, which is what gives the flamingos their iconic pink coloring. Fortunately for bird watchers, the flamingo is not the only interesting bird to be found in the Bahamas. A Bahamas wildlife tour will also give you the chance to view the Bahamian parrot, cormorant and pelican, all of which are excellent specimens to cross off your bird watching list. Though you certainly can experience a lot on the surface, a large portion of Bahamas wildlife can be found underwater. Whether you’ve visited Iguana island in Bahamas, or the swimming pigs, you will undoubtedly love to see dolphins. These beautiful and fascinating mammals have swum their way into the hearts of people around the globe. Whether you spot a pod of them whilst exploring the waters on a boat or in scuba gear, or you visit the sanctuary on Paradise island and swim alongside them, spotting a dolphin is one of the top things to do on a Bahamas wildlife tour. Of course, Bahamas marine life doesn’t end there. You are bound to see a range fish on your trip to the Bahamas. There are numerous types of fish in the Bahamas, covering everything from enormous game fish like blue marlin, to exciting sports fish like bonefish. Bahamas has become a fisherman’s paradise with this excellent selection of fish to discover, and while many come here for the sport of it, you can also enjoy feasting on your catch afterwards. Of course, the Bahamian waters aren’t just full of fish to catch and eat, there are a number that one can simply admire. Bahamas reef fish prove to be a spectacular sight to behold as they dart and spiral around colorful coral. Rock beauties, yellowtail snappers, sergeant majors, groupers, you name it, the Bahamas has it. While fish and dolphins can certainly be fantastic to spot, these waters offer so much more. One of the most otherworldly experience a human can have is to witness a sea turtle in motion. The effortless grace and power that they exhibit as they glide through the clear Bahamian water is like nothing else on earth. These truly are majestic creatures and are well looked after in the Bahamian waters. 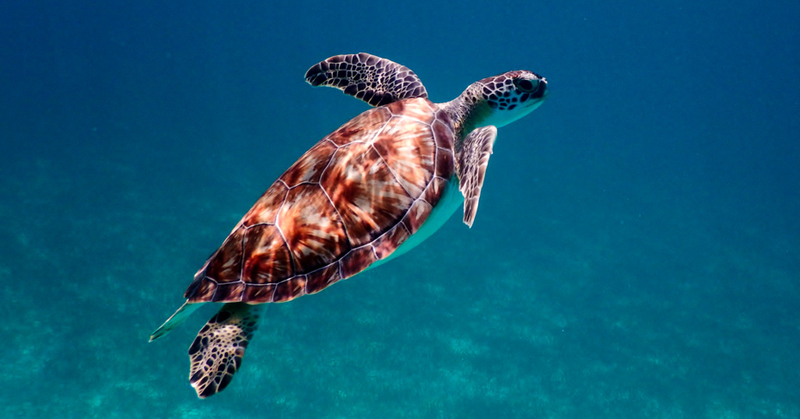 These are somewhat rare, so a sighting is quite a special occasion in the Bahamas, but if you are lucky enough to see a turtle, it will undoubtedly be an experience you will never forget. One creature that comes close to matching to smooth grace of the turtle is the stingray. While they can mostly be found nestled in the sandbank at the bottom of the ocean, you might catch one soaring through the crystal clear turquoise waters on a Bahamas wildlife tour. Want to swim with the Turtles at Green Turtle Cay? Choose one of our Day Trip to Green Turtle Cay. Whatever your reason for visiting the Bahamas may be, seafood will undoubtedly be a part of that experience, whether its nothing more than the mouthwatering smell of grilled fish wafting through the markets or a platter at a seaside restaurant. What you will undoubtedly notice is that conch meat is used in almost every dish. Cracked conch is a delicious deep fried conch dish and is an ideal choice for anyone unsure of trying this new food. Conch fritters, conch salad and an endless array of other options will also be made available to you the moment you arrive in the Bahamas. The salads are particularly refreshing in the Bahamian heat, often being mixed with citrus fruits and spices which give the dish a unique and delicious flavour. The chewy white meat can be enjoyed raw or cooked, and is a very unique and delicious addition to any dish. The Bahamas is a destination that is absolutely filled to the brim with wildlife of all shapes and sizes. It could take years to explore all of the islands and cays in their entirety to discover every single creature that this exceptional destination has to offer, but it would be absolutely worth it. Bahamas wildlife features such fascinating animals, all of which have unique traits to ensure that not a single moment of your tour will be monotonous. Discover the Bahamas with Bahamas Air Tours with Day Trips and Island Hopping Tours.